Copyright Fuji Xerox Co. All Rights Reseved. Fuji Xerox Co., a major office equipment manufacturer based in Japan, launched in June 2014 a project to use its production printers for the printing of learning materials, with the goal of helping to resolve educational disparity among children in emerging countries in the Asia-Pacific region where it conducts business. The project first delivered workbooks to approximately 400 children in a disadvantaged area near Manila in the Philippines. Materials produced in the project are tailored to meet local needs, with Fuji Xerox serving as coordinator, soliciting sponsors to provide the contents of the materials free of charge, as well as financial sponsors to cover the printing and other costs. After the materials are printed with Fuji Xerox production printers, local non-governmental organizations (NGOs) distribute them to children and support their studies. Aiming to increase the number of recipients through collaboration with more sponsor companies, Fuji Xerox plans to launch the project in other countries, such as Thailand and Vietnam, to distribute workbooks to 100,000 children across Asia-Pacific region in the next decade. 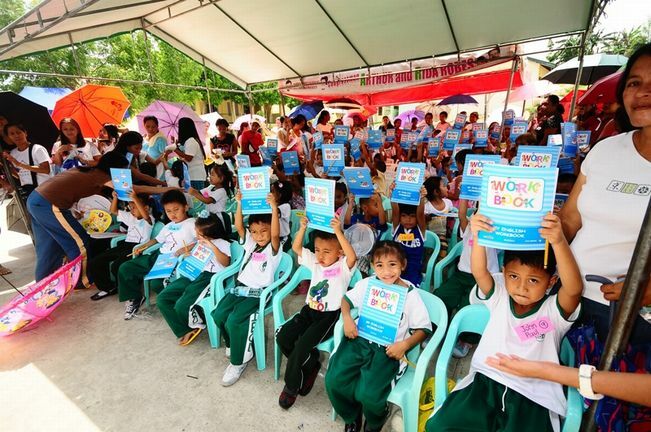 The first workbook delivery was made to children in several Gawad Kalinga villages in Bulacan Province; the villages are operated by the local NGO Gawad Kalinga, which has been working to provide housing for people in disadvantaged areas. The NGO, which worked with Fuji Xerox on a project back in 2007, currently supports some 60,000 families in the Philippines. Fuji Xerox and Gawad Kalinga are jointly monitoring the progress of children's studies after distributing the learning materials.